The quality of your mental state is influenced by the food you eat, says Smt Mankawar Devi Fomra, a great-grandmother from Chennai. Guided by faith and devotion for the lord, she eats satvik foods and leads a satvik life. She exudes an aura of such pure energy that those who meet her instantly feel her love and compassion. 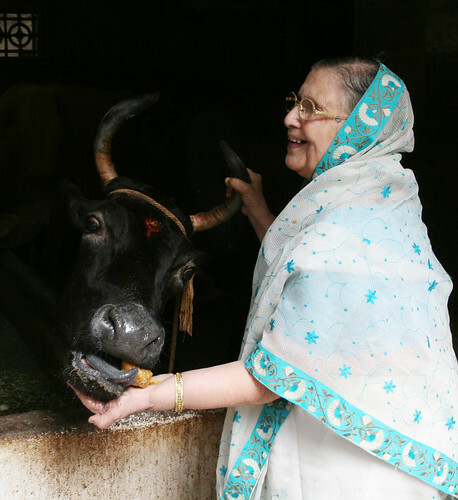 Since her young days, she has fed the cows at home early in the morning and taken care of them. Such is her love for this beautiful creature that the very idea of allowing milk to curdle is anathema to her. Sweet dishes are prepared in a sanctified space of her home everyday and offered to the lord as bhog. Her daughters, daughters-in-law and the next generation of bahus have learnt many recipes from her for this divine offering. Offering Nagari laddus as Prasaad has been her unique practice. The simple recipe below is one of the family favourites for the bhog. Lower the flame and roast the coarsely pounded almonds until golden brown. Add the wheat flour and gram flour and roast until light brown. Add the powdered sugar and roll into laddus. This recipe was first published in The Great Granny Diaries – a column in Harmony Magazine. Part-1 of this post is the interview with Mankawar Devi Fomra, a Rajasthani Maheshwari from Chennai.